Every well needs a quality pump to deliver the water from beneath the earth into your home . 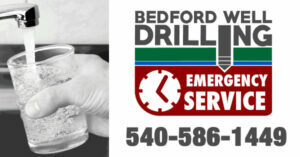 Not only will Bedford Well Driling drill the well, we also install the pumping system and guarantee our work. There is a lot to consider before installing a pump for your well. We have the experts with the answers. JACUZZI, FLINT & WALLING (F&W) as well as GRUNDFOS commercial pumps. The key to selecting the right size pump is figuring out how many gallons per minute you will require at peak periods. A pump should be selected to meet the normal peak demand for the household rather than average use. There are two common methods for sizing a residential pump system that gives similar results. The capacity of the pump system in gallons per minute should equal the number of fixtures in the home. This must take into account all use for the kitchen, bath, appliances, outside irrigation, and a pool or hot tub. In this model, a modern home with 2 bathrooms (3 outlets each), kitchen sink, dishwasher, washing maching, laundry tub and 2 outside outlets would require a capacity of 12 gallons per minute, based on the 12 fixtures our outlets. A second model, using the same fixtures as mentioned above, calculates capacity based on a seven-minute peak demand.